for their outstanding performance, dedication, and support for the Junior Victoria program. "If we can see further, it is because we stand on the rungs of a ladder built by those who came before us"
Don Osadick(1980-84) Played four seasons with the Victorias, and accumulated an amazing 445 points, an MMJHL record that stands today. Lead the league three times in points to capture the Manitoba Major Junior Hockey League’s Steve Clause Memorial Trophy, in addition to twice being awarded the league’s Ken Prodonick Memorial Trophy for Ability & Sportsmanship. A first team all-star in three of his four seasons, he still lives in the area with wife Laurie and three children, Tyler, Kaleigh, and Brody. His achievements are truly exceptional, and distinguish "Number 17" as the inaugural inductee into the Major Junior Victoria Hall of Fame. Derek Kochenash (1992-96) Played four seasons with the Major Junior club. A gifted centreman, blessed with superior vision and exceptional leadership skills. Career point totals are among the highest of all Junior Victorias, past and present. His 65 assists during the 1995-96 season are an all-time team record. In 95-96, was a first-team All-Star, won the MMJHL's Steve Clause Memorial Trophy (scoring leader), and recipient of the Vic's MVP Award. Jeff Sinnott (1995-98) A St. Vital product who played three seasons with the organization. Was the backbone of the defensive corps, often logging 35+ minutes per game. Equally adept in his offensive and defensive skills, always calm under pressure, possessing an uncanny ability to read and react. Recorded 65 points in 96-97, the second highest for defencemen in franchise history. Was a First-team All-Star in 96-97 and 97-98; won the MMJHL's George Cadzow Trophy (Best Defenceman) in 96-97, won the Vic's MVP in 96-97, and 97-98, along with the team's Top Defenceman Award all three seasons. Murray Roy (1979-81) A resident of the St. Boniface area, became an import to the Vics in 1979 following a brief stint with the Riels. A gritty, two-way forward who played with a a definite edge, all-the-while possessing an excellent scoring touch. Playing on a line with rookie Don Osadick in 1980-81, became the first 50-goal scorer for the organization. His 104 points in 80-81 rank seventh on the all-time single-season Vic leader board. Not one to shy away from the corners, compiled over 100 penalty minutes each year. Was selected as the team MVP in his final season. Richard Smith (President, 1982-87) Long-time Junior Victoria Executive who served as team president from 1982-87. A gentleman who displayed exceptional devotion to the hockey club. By way of tireless effort and deep-seeded commitment, is largely credited with rescuing the organization during a tumultuous financial period in the 1980's, which threatened the continued existence of the organization. A lifetime member of the club, and its inaugural inductee into the Builders' Category. Daryl Hamelin (1991-95) Assistant Captain (1993-94) A St. Vital resident and product of the AA Victoria program who played four seasons with the Major Junior Victorias. A gifted right winger, blessed with superior vision coupled with exceptional passing skills. In 1994, Daryl rang up 104 points with a balanced production of 52 goals and 52 assists to win the MMJHL League Scoring title. Daryl’s work ethic in all ice zones, his tenacity and energy earned him the nickname “Buzz-saw". Accolades: 1993-94– MMJHL First Team All-Star; MMJHL’s Steve Clause Memorial Trophy (League’s Highest Scorer, 110 pts)1993-94; Victoria’s Hardest Working Player Award 1992-93. Bert Eyssens (President, 1990-97) A long-time resident of St. Vital, whose strong leadership was a driving force for the St. Vital Junior Victorias. A gentleman who displayed exceptional devotion to minor hockey, and, specifically, to the Major Junior Victoria hockey club. Served on the organization’s Board of Directors for many years, and was the club’s General Manager and team President during 1990-1997. Bert was willing to volunteer and assume additional responsibilities when there was a vacancy. The father of four sons and three daughters, Bert was well trained in assisting youngsters in their pursuits of various sports. Regrettably, Bert passed away in 2007, but Bert’s passion for the Victorias remains with us till this very day. Gary Keats (President, 1975) A long-time resident of St. Vital who still lives in the community today. Gary has the distinction of being the first President of the Junior Victoria’s organization. Gary, along with original members Bob Lowenberger, Ed Aplin, Joe Venables, Brian Irwin, Manny Johns, and Harry Morris were the founders of our organization. Kevin McCallum (1985-1989), Assistant Captain 1987-1988, 1988-1989 Kevin started playing hockey out of the Glenlee Community Club, and went on to play his minor hockey with the Vics AA program. Kevin played four years with the Major Junior Club and was a solid stay-at-home defenseman who anchored the blue-line. After a solid MMJHL career, Kevin went on to play for the Morden Redskins of the SEMHL for seven more years and helped them capture five league championships. Accolades: MMHJL East Team All-Star (1988,1989), Top Vic’s Defenseman 1988, Co-Top Vic’s Defenseman in 1989. Rick Cancilla (1979-1981), Assistant Captain 1980-1981 A St.Vital resident from the Glenwood Community Club who played in the Vic's AA program. Rick played three years with the Major Junior Victorias and, at only 5’9”, he was a quick forward with great instinct for both scoring lots of goals and letting the other team know when he was on the ice. Rick will always be remembered for his dedication to playing hockey as a winner, and for the spirit he left as a team player. 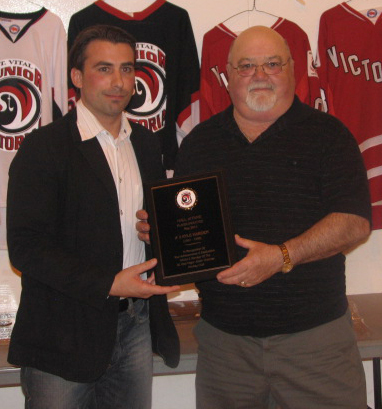 In his name, the Rick Cancilla Memorial Trophy is presented annually to the Major Junior Vic’s leading scorer. Rick tragically passed away as a result of an automobile accident, September 2, 1995. Though he is not here today he is still in the hearts of all who new him. Don & Grey Kennedy, St. Vital Major Junior Victoria Volunteers 1982-2004. 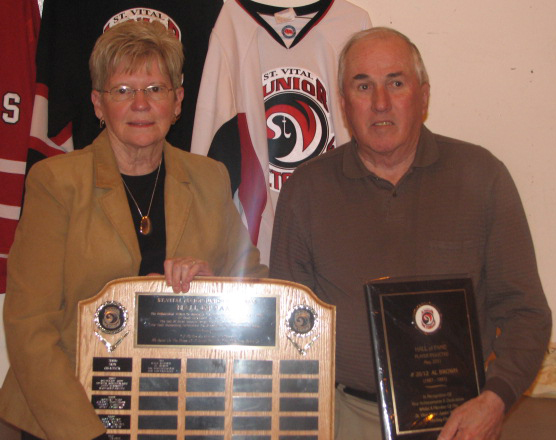 Long-time residents of St. Vital, Don and Grey were with Vic’s organization for 22 years. Don served on the Board from 1982 till 1991. In 1984 he served as Team President. Grey joined him on the board in 1984. In 1991, although Don & Grey stepped down from the board, they continued to sell 50/50 tickets at all home games fro the organization until 2004. Al Brown (1987-1991) Team Captain, 1989-1990, 1990-1991, Assistant Captain 1987-1988, 1988-1989, Hailing from St.Vital, Al played out of Windsor Community Club and in the Vics AA system. He played four years with the Major Junior Club and was always considered a leader with the Junior Vics from the beginning. He was a small, speedy and gifted forward that gave his all each and every night. After playing in the MMJHL, Al started coaching in the St.Vital Victorias Minor Hockey program as well as an Assistant Coach with the St.Vital Junior Hockey Club in 1993-1994. 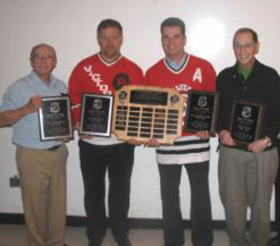 Accolades: MMJHL All-Star; 1988-1989, 1989-1990, 1990-1991, Team MVP; 1987-1988, 1988-1989, 1989-1990 Richard Smith Award; 1990-1991.
played with passion, dogged determination and never took a night off. His strong defensive play and gritty, determined effort, specialties often overlooked in the age of glowing offensive statistics, were a testament of his value to and appreciation by his team mates and the organization. Justin Carloni (2002-2006)- A St. Vital resident that played his minor hockey at the Dakota Community Centre and who came up through the AA Victoria and AAA Warrior programs. He played four years with the MMJHL Vics. Justin is the holder of eight Victoria goaltender records. He is the first Vic Goaltender to to win the MMJHL 's Ron Smith and Myron Prymak awards and was an integral part of our 2003-2004 Championship Team. Accolades , MMJHL All Star 2003-2004,2004-2005,2005-2006. Team rookie of the year 2002-2003 Team Hardest working player ,2004-2005, Team Regular season MVP 2003-2004, Team Playoff MVP 2002,2003, Ron Smith Award winner, (MMJHL Top Goaltender) 2003-2004, Myron Prymak Award winner (MMJHL League MVP) 2003-2004. Michael Gregg 2003-2007 A St. Vital resident that played his minor hockey at Glenlee, Norberry and Dakota Community Clubs, and then on to the St.Vital AA minor hockey system. Michael played four years with the MMJHL Victorias and was considered a hard nosed player with soft hands. Michael was a member of the 2003-2004 Victoria Championship Team. Accolades MMJHL All-Star 2004-2005,2005-2006,2006-2007, Team MVP Playoffs, 2004-2005 Team Leading Scorer 2005-2006. James (Jim) Murray Bateman, St. Vital Junior Victoria Board Member 1990-present. A long time resident of St.Vital , Jim still lives in the community today. Jim has been involved in Minor Hockey since 1977 when he joined the Norberry Community Club as their hockey Chairman. In 1980 he served as President of the St. Vital Minor Hockey Association. From 1983 to 1990 he was on the Warriors AAA minor Hockey Board before coming to the St. Vital Victorias Junior Hockey Club in 1990, where he served as Treasurer from 1995-2008. He continues to serve as a board member. Jim is not just a volunteer with sports in St.Vital, Jim and his wife Maureen as well as raising their own children adopted eight other children and fostered over 40 kids. In 1991 Jim lost his wife Maureen, but with the love and support of his family he still keeps going! Until recently Jim volunteered once a week at Winnipeg Harvest. Jim Bateman truly defines a real volunteer! ﻿﻿Garnet Wilbon﻿﻿ # 8, a St. Vital resident played his minor hockey out of Glenwood CC and went on to play with the AAA St. Boniface Saints from 1979 - 1981. In 1981 he joined the Vics AA Program where he finished his minor hockey. In 1985 he joined the Vics Major Junior Team where he played for 4 years as a solid, well rounded, hardworking defenseman. Asst captain 1987 - 1988. His coaches could always depend on him to play wherever they needed him. His team could count on him to defend his goalie and get the puck out of their end or bust into the offensive zone to score a goal. Garnet was known for his hard slap shot from the point. Accolades: MMJHL All-Star 1986- 1987, 1988 - 1989. Jayson Nickol # 11, a St. Vital resident played all of his minor hockey out of Dakota CC until he was 15 years old. He then made the jump to the Warriors Provincial Midget AAA team where he played the next 2 years. In 2002 he joined the Vics Major Junior Team where he played for 4 years including the 2003 -2004 championship team. Asst captain 2004 - 2005 and 2005 - 2006. Even though Jayson never put up big numbers on the score board, he was a defensive force that was asked to check other teams top lines or kill penalties every night. Those who watched him play remember a small speedy player skate around the ice checking everyone he could. The remarkable thing is that he did this without wearing shoulder pads ! Accolades: Played on 2003 - 2004 Championship team. Coach Paul Johnson's comments:" Leader, team player, respectful, respected, winner ... A player every team wants and needs. A tireless worker wrapped within the heart of a lion. The first guy in line for every drill and the first to stand up for a team mate. An integral component of our 'band-of-brothers', championship core". Travis Davidson # 14, a St. Vital resident who started his hockey career at the Windsor CC and went on to play his minor hockey with the St. Vital Victorias AA Minor Hockey program. In 2002 he started his 4 years with the Vics Major Junior Team and played both as a forward and a defenseman. In 2003 - 2004 season he was tied for the league's best plus/minus rating. Asst captain 2005 - 2006. Travis didn't say much but rather lead by example. Accolades: MMJHL All-Star 2004 - 2005. Team most improved player (Marigold award) 2002 - 2003. Played on 2003 - 2004 Championship team. Coach Paul Johnson's comments: " A steady and versatile player who excelled at defense and forward. A reliable team player who never panicked with the puck, had a sound understanding of the game, and rarely got caught out of position. A very well respected player, and to no one's surprise, one who was consistently among our highest plus/minus ratings. Al & Wendy Riel (Builder's Category) are long time residents of St. Vital who still live in that community today. Al has been involved in Minor Hockey since 1967 where he first coached at Glenlee CC. From the start, a young lady named Wendy Wilson was at his side and has been there ever since with Al the coach and Wendy the manager. The Riel's got involved at Glenwood CC in 1970 - 1985 where they took on various roles. This giving back to the community as a volunteer was probably in Wendy's DNA. 1975 - 1985 involved with St Vital Minor, Al coaching, Wendy managing. 1990 - 1992 Al coached, Wendy managed the Fort Garry Twins with their son Robert. 2000 - 2002 Al coached, Wendy managed the St. Vital AA Vics with their son Kevin. In 1992 they both joined the St. Vital Victorias Junior Hockey Team organization, Al as member at large and Wendy as secretary. Al took on the treasurer duties in 2009. Just so everyone is clear, even though Dwayne is listed as Team President, the real boss on the Board is Wendy. It would be difficult to find anyone who has given so much to helping keep kids on the ice. Cory Brokop # 19, a St. Vital resident who played all of his minor hockey out of Dakota CC until he was 12 years old. He then played in the Vics AA Program. In 2001 he joined the Major Junior Vics program where he played for 4 years, including the 2003 - 2004 championship team. Kyle Harden, a fellow teammate describes Cory as " the ultimate teammate, given a role, accepted his role and executed same. The Glue Guy in the dressing room who made everyone feel welcome and also held guys accountable. Still a great friend today and I'm proud to say I played hockey with him on the Vics". Accolades: Played on the 2003 -2004 Championship team. Randy Baker # 10, a St. Vital resident who started his hockey career at the Glenwood CC and went on to play his minor hockey with the St. Vital Victorias AA Program. In 1985 he joined the Vics Major Junior Team where he played for 4 years. Randy was known as an offensive threat who could set up as well score goals. When asked to describe what type of player he was, he replied he was an offensive grinder! Accolades: MMJHL All-Star 1985 - 1986, 1986 - 1987, 1987 - 1988, 1988 - 1989. MVP All-Star Game 1986 - 1987, 1987 - 1988, 1988 - 1989. Note, there were no Team Awards back then. Ryan Buchanan # 15, a St. Vital resident who started his hockey career at Greendell CC and went on to play his minor hockey with the St. Vital Victorias AA and Winnipeg Warriors AAA programs. In 1999 he joined the Vics Major Junior Team where he played for 4 years and was known for his goal scoring and play making skills. Accolades: Most improved player (Marigold Restaurant Award) 2001 - 2002. 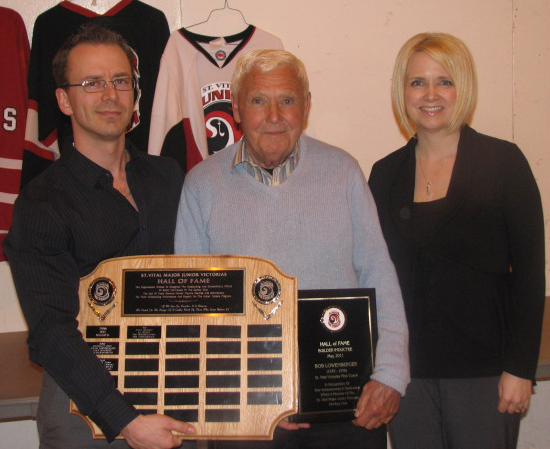 Leading scorer (Auto Haus Rick Cancilla Award) 2002 - 2003. MMJHL All- Star 2002 - 2003. Phil Mager (Builder's Category) is a long time resident of St. Vital who now lives in St. Boniface. Phil has been involved in Minor hockey since 1975 when he first coached his oldest son PJ at Glenlee CC. Following long volunteer list clearly demonstrates his love of hockey and sense of community. 1976 - 1988 Executive Board at Glenlee CC. 1981 - 1988 Winter Sports Director at Glenlee CC. 1984 - 1987 Vice President of Olympic Hockey in Winnipeg. At Glenlee CC you could see him help make the ice every year and was instrumental in the construction of the Walter Jennings Centre. His commitment to Glenlee CC was recognized with an " Honorary Lifetime Membership". In 1994 Phil joined the Vics Major Junior Board and is still there today as Vice President. ​ Kevin Riel # 4, a longtime St. Vital resident started out at the Glenwood Community Center and went on to play his minor hockey with the St. Vital Victorias AA Minor Hockey program. In 1993 he missed his first year of MMJHL eligibility to focus on his studies at U of M in the Education Department. In 1994 he joined the Vics Major Junior Team where he played the next three years and was known as a stay at home defenseman. He may not have had great offensive numbers but he made up for it in great defensive numbers. 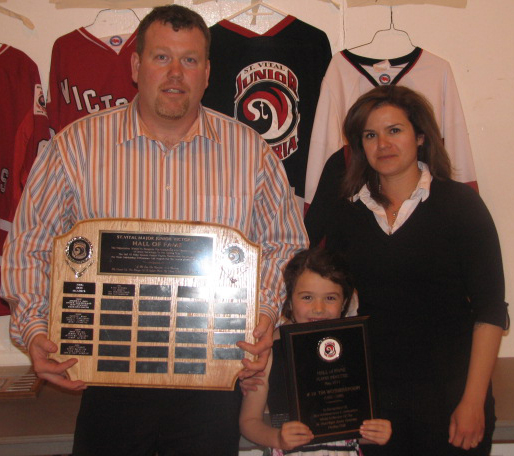 ​Accolades: Vic's rookie of the year 1994 - 1995, MMJHL All-Star 1996-1997. Rob Newton # 11, started his hockey career out of the Greendell Park Community Club and played his minor hockey with the St. Vital Victorias AA Minor Hockey and the Warriors AAA Hockey Programs. In 1995 Rob joined the Vics Major Junior Team where he played the next four years. He was known as a gritty player and leader both on and off the ice. ​Accolades: MMJHL All-Star 1998 - 1999. ​Catlin Baydak # 22, started his hockey career out of the Dakota Community Centre and went on to play his minor hockey with the ST. Vital Victorias AA Minor Hockey and the Warriors AAA Hockey Programs. In 2003 Catlin joined the Vics Major Junior Club and played there for five years. This five year term has been accomplished by very few players. Catlin was known as an offensive, smooth with the puck defenseman. ​Accolades: Asst Captain 2006 - 2007, Captain 2007 - 2008, Rental Experts Oustanding Defenseman 2006 - 2007, 2007 - 2008, Championship Team 2003 - 2004. Paul Johnson (Builder's Category) has called St. Vital home for many years and has a long history of hockey involvement. In 1999 he was the Head Coach/ GM of the Junior Vics. He served as Coach for seven seasons and as Coach/GM for nine seasons. He served on the Junior Vics Board of Directors for seven years. After coaching he served on the MMJHL League Executive as Vice President and Vice President of Registration. Coaching awards include AAA coach of the year in 1997, Nick Hill Memorial Trophy (MMJHL coach of the year) in 2001 - 2002 and 2003 - 2004. In 2003 - 2004, Vics championship year, his record was 41 wins, 1 loss, 2 ties and 1 OTL for 85 points. These are league records that still hold today. He lead the Junior Vics to league finals in 3 consecutive years with the win in 2003 - 2004. Brad Dnes # 5, started his hockey career out of the Greendell Community Centre and went on to play his minor hockey with the St. Vital Victorias AA Minor Hockey program and the Winnipeg Warriors AAA Hockey Program. In 1995 Brad joined the Vics Major Junior team where he played for three years. He was known as a forward with semi-soft hands and could mix it up in front of the net. On the ice Brad was a coach's player who did whatever it took to win. Off the ice, that's another story ! Accolades: Asst Captain 1997 - 1998, 1998 - 1999, MMJHL All-Star 1998 - 1999. ​Dan Dnes # 16, started his hockey career out of th Greendell Community Centre and went on to play his minor hockey with the St. Vital Victorias AA Minor Hockey program and the Winnipeg Warriors AAA Hockey Program. In 1997 Dan joined the Vics Major Junior Team where he played the next four years. He was known as shifty player with a great shot and finish around the net. ​Accolades: Asst Captain 1999 - 2000, Captain 2000 - 01, MMJHL All-Star 1998 - 1999, 1999 - 2000, 2000 - 2001. ​Darrin Keats # 9, started his hockey career out of the Glenlee Community Centre and went on to play his minor hockey with the St. Boniface Saints AAA Hockey Program. In 1983 Darrin joined the Vics Major Junior Club where he played four years. He was known for his quick release and could score at will. Darrin was a quiet leader who led by example. ​Accolades: Captain 1985 - 1986, 1986 - 1987, MMJHL All-Star 1985 - 1986, 1986 - 1987. ​Herb Mowatt (Builders Category) has a long history of hockey involvement. In 1991 - 1992 Herb joined the St. Vital Victorias Midget AA Program as the trainer. 1992 - 1998 he was a trainer with the Winnipeg Warriors and the Winnipeg Sharks Hockey Programs. Apparently, to avoid riding buses all over Manitoba, he joined the St. Vital Victorias Major Junior Hockey Club where he served as trainer 1998 - 2007 with head coaches Don Lombaert, Dwayne Joseph, Gerry Navitka, Paul Johnson, Marc Boulanger, and Sean Miller. In 2002 he joined the Board and served as Vice President till 2007. Herb was the trainer at two MMJHL All-Star games and also on the first Jack McKenzie Championship team in 2003 - 2004. In 2006 the Players and Builders Vics Hall of Fame was established and Herb is the one who orchestrated the selection criteria. Darryll Joseph (Builder's Category) has a long hockey history in St. Vital. He has lived his entire life in St. Vital and started his hockey playing goal out of the Glenlee Community Club and then with the St. Vital AA Minor Hockey program. In 1974-1975 he won the City and Provincial Championships on the Glenwood Juvenile Team. He then joined the Vics Junior team in 1976 where he played for two years. In 1980 he joined the Major Junior Vics Board and served there for two years. Also did timekeeper duty 1980-1983. Then in 2005 he was convinced to return to timekeeping and has been at it ever since. Today he works for Progress Rail, wife Lori, sons Stephen and Michael, and also a new grandfather. Sean Peters #22 a longtime resident of St. Vital started his hockey career out of the Greendell Community Center and went on to play minor hockey with the St. Vital Victorias AA Minor Hockey Program. In 1996 he joined the Vics Major Team where he played the next four years. Sean was a quiet leader, strong along the boards, hardworking, with a great shot and an incredible back hand. ​Accolades: MMJHL All-Star 1998-1999, 1999-2000. Rick Cancilla (Team leading scorer) 1999-2000. ​Brad Nechwediuk #11 a St. Vital resident who started his hockey career out of the Norberry Community Club. He played his minor hockey in the St. Vital Victorias AA Minor Program and Winnipeg Warriors AAA Hockey Program. In 1982 he joined the Vics Major Junior Club and played there for four years. He was known as a hard working defenceman, never took a shift off, and who would always jump in when teammate needed assistance. Brad's role as a tough player is still remembered when fellow teammates sit around talking about the old days. Patrick Martin #8​ a St. Vital resident started his hockey career out of the Greendell Park Community Club. Hi family moved to Emerson Mb. where he played minor hockey for two years. His family then moved back to St. Vital where he played the remainder of his minor hockey with the St. Vital Victorias Minor Hockey Program. In 1992 he joined the Vics Major Junior Team where he played for four years. Pat was a man playing with boys. Anyone who played against him will acknowledge he had one of the hardest shots and also one of the hardest hitters in the MMJHL. Al Coppinger #22 started his hockey out of Norberry Community Club and then jumped to AAA hockey playing for the Saints Tier 1 until 1975. In 1974 he was drafted by the Winnipeg Clubs of the Western Hockey League where his rights were traded to New Westminster Bruins. He decided to instead finish high school and joined the Jr Vics in 1976 where he played four years. Teammates describe him as "the smoothest skating defenceman in the league and his skills superior to anyone else". Accolades: MMJHL Rookie of the Year 1976-1977, MMJHL All-Star 1976--1977, 1978-1979, 1979-1980. Wes Anderson # 15 and #17 has been a long time St. Vital resident and started his hockey out of Greendell Community Center and then played minor hockey with St. Vital Victorias AA Minor Hockey and then Winnipeg Warriors AAA Hockey. In 1996 he joined the Jr Vics where he played for four seasons. Wes was known as a calm player who never said much. He was one of the big boys on the ice and those that may have pushed his buttons probably have a different definition of "calm player". ​Accolades: MMJHL All-Star 1999-2000, Team Outstanding Defenseman 1998-1999.